M D Phelps Plasterers in Swindon pride ourselves on the high quality finish and customer satisfaction that all of our customers enjoy along with the affordability of our pricing. Here are Just a few our the recent projects we have completed , these range from completely re-rendering a whole house and finishing, to plastering arches. At M D Phelps no job is too small and all customers receive the same high quality service and attention that they deserve. So whatever your project please do not hesitate to contact us. 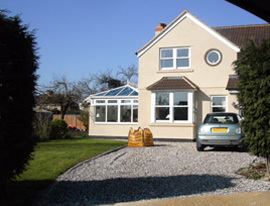 House was totally rendered using specialist K-Rend coloured polymer render giving a versaitle and high quality finish.. 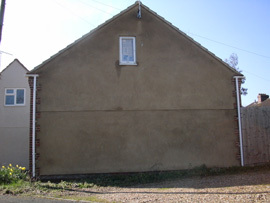 Totally rendered gable end of house in Swindon with sand / cement render prior to finish being applied awaiting customers decision pebble dash or paint. 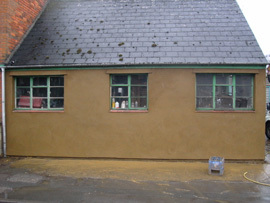 Garage & Mechanics workshop in Swindon Removed old render and totally re-rendered with sand / cement render awaiting finish. 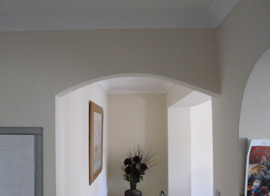 Plastered walls and 2 different plastered arches, looks fantastic now with painted finish. We are able to plaster many different shaped arches including bullseye windows. 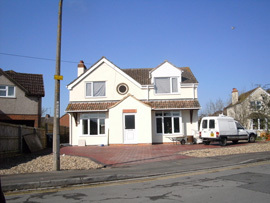 Totally rendered house in Swindon with the top finished in cantebury spa pebble dashing and the bottom smooth sand / cement rendered with a masonry painted finish. 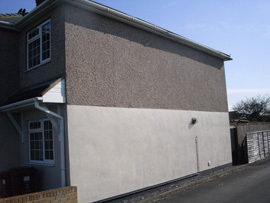 Entire property in Swindon sand and cement rendered and cleanly finished in masonry paint. I was introduced to MD Phelps Plastering about 3 years ago after using a string of unreliable plastering companies. In this period they have completed in excess of 30 jobs for me ranging from plastering, floor screeding, rendering and coving. They arrive when agreed carry out the work to a high standard and always leave my customers premises in a tidy condition. They have also completely plastered a building extension at my own premises so I can’t think of any better recommendation than using them on your own premises. Always very reasonable and very willing to oblige probably in my opinion the top plastering firm in Swindon.